Mangos are an ingredient that is available all year around, and they go with so many things. 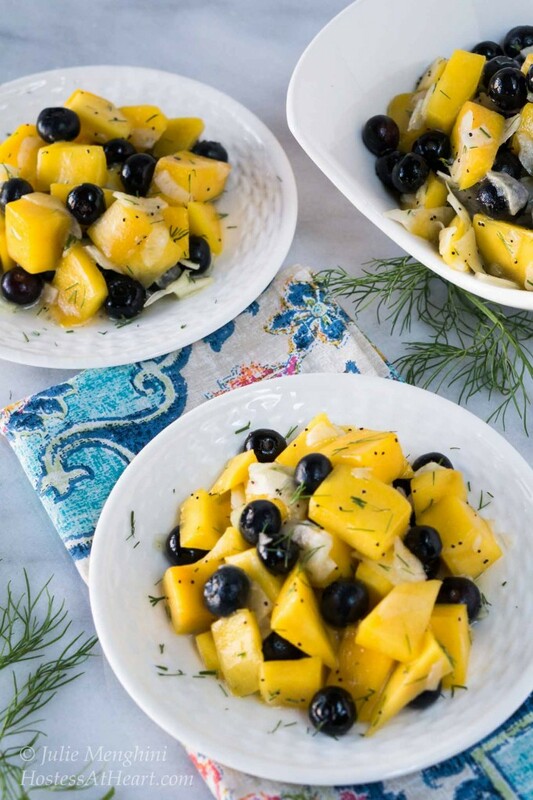 This Mango, Blueberry and Fennel Salad is simple to put together but has a lot going on. It has a natural sweetness from the fruit and a delicious crunch from the fennel. If I lived in an area that was warm all year around, I would have a mango tree and an avocado tree. Oh, and I have to have a lime tree for the margaritas too. The first time that I tried mangos it was love at first bite. My son has a mango tree in his yard and when he moved there it was overgrown and he contemplated removing it. I threatened him with a time out. The tree stands and is just waiting for me to visit. 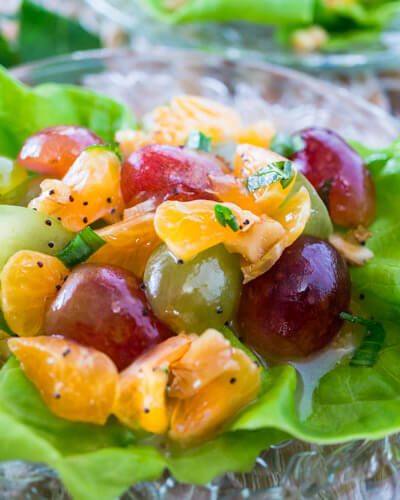 The beautiful colors in this salad are a feast for the eyes, and it can be made ahead of time. The colors stay vibrant and the fennel retains its crunch even after a couple of days. If you haven’t had fennel before, it has a mild black licorice flavor. If that isn’t your thing, jicama would work too. 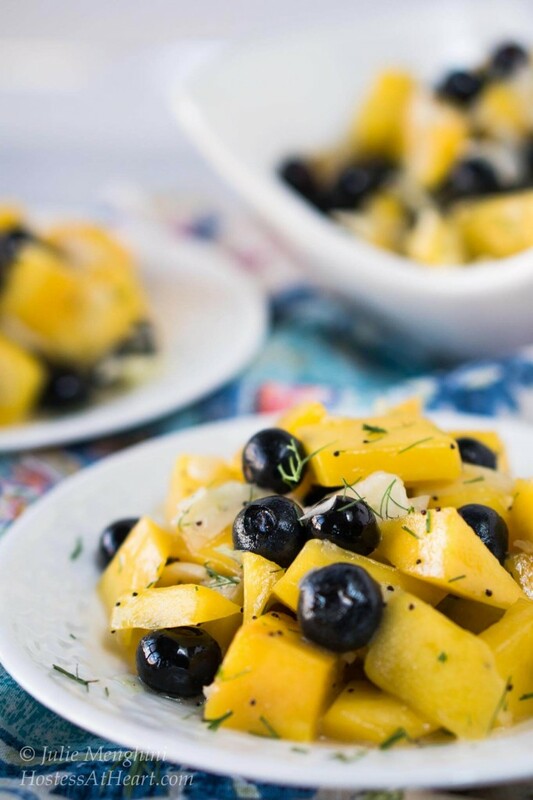 Mango, Blueberry and Fennel salad is perfect with a summer picnic or a bowl of soup in the winter. It's easy to make but beautiful enough for any table. Combine all salad ingredients in a medium sized bowl. Prepare vinaigrette by combining all ingredients in a jar or shaker. Pour vinaigrette over salad until lightly covered. Mix to combine. Jicama can be used in the place of fennel. 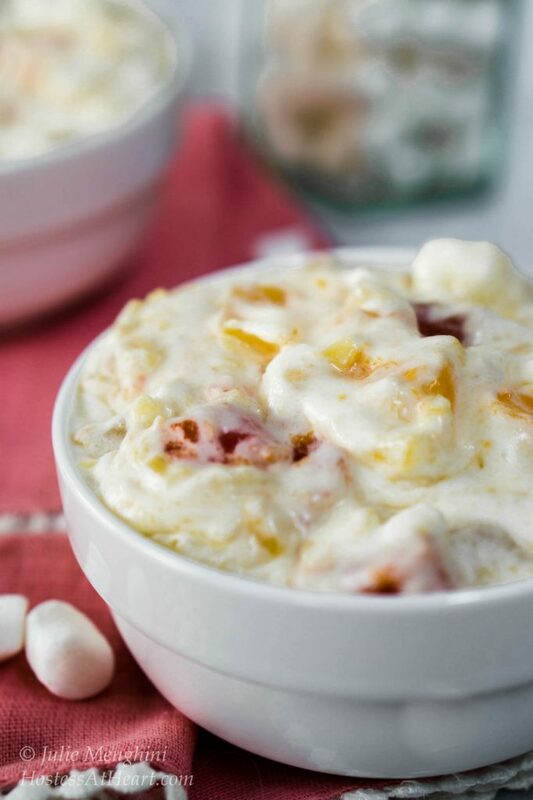 Looking for other great salad to try right now? What a tasty and delicious looking salad. I like the combination of mango & blueberries. Thank you! I love the colors when everything else seems brown or grey. I hope you are enjoying your weekend and thanks for stopping by! Thank you Ivette! It makes me hope for spring! What a yummy salad, Julie! 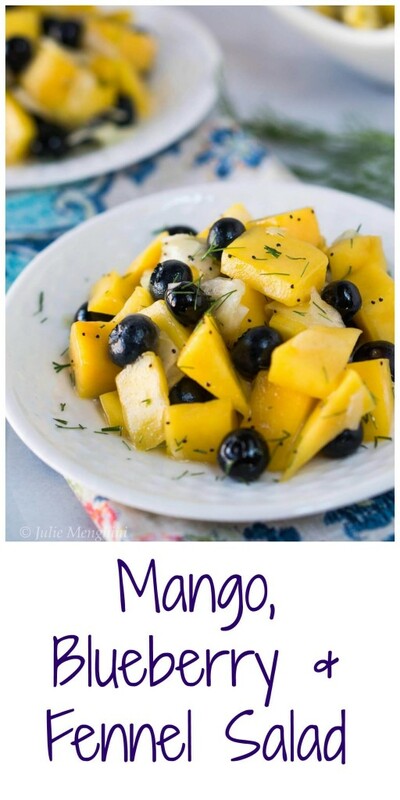 Mangoes and blueberries are 2 of my very favorite fruits so I know I would love this. I love fennel too, but would never have thought to put them together. I bet it is wonderful, though. The vinaigrette sounds good as well. I am going to have to try this! Thank you Shari! Do you have any trees on your property? My Aunt lived in Scottsdale and had the best grapefruit and peaches! another beautiful salad you are giving to us, yumm! Thank you Lynz! Hope you are doing marvelous! Thank you Chitra! Simple and easy too! Enjoy your evening. Thank you Petra! I think us foodies all want our own orchards! This salad looks like a breath of fresh air in the winter! Mangoes have been on sale at the grocery store lately, so I will definitely keep this mind! The flavor combination sounds great! Thank you so much Jenny. We enjoyed this salad and I hope you will too! Enjoy your weekend! Thank you so much Freda! I hope you are having a wonderful day! What a great healthy fruit salad! 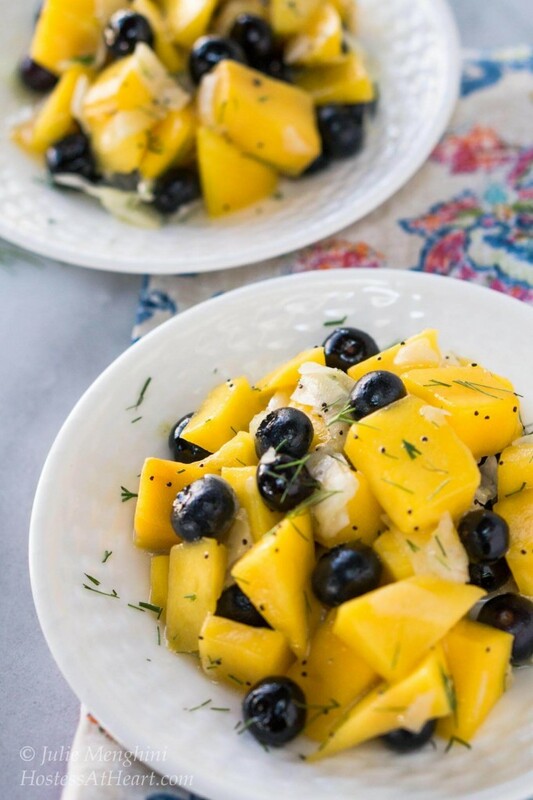 I love this mango and blueberry combination! This sounds so refreshing and delicious Julie! I’ve never thought of putting a vinaigrette on a fruit salad. I don’t know what could beat the lemon, the bit of sweetness and the bit of salt combined with the fennel. I would want a mango tree and a lemon tree. And while I’m at it, maybe a whole orchard of other trees as well! Thank you! I would love a lemon tree too. We aren’t asking for too much are we? Thank you Zeba! I never thought to put fennel in a smoothie! Brilliant!! If you try this, please let me know what you think. Ah! This looks amazing! I’ve been enjoying lots of mangoes lately, so I’ll definitely need to mix up my daily salads to make something this refreshing. Happy FF, and have a fabulous weekend! Thank you Kaila! I hope you have a fabulous weekend too! Wonderful refreshing salad Julie. Just coming back from Maui, I can say I has quite a few fruit salads made with mango.This is one to make at home. Thank you. Oh what a wonderful trip Donna! I hope to see pictures soon. What a beautiful salad. I’ve never had that particular combination. Nice! Thank you Chef Jeff! I appreciate you stopping by! Thank you Suzanne! I really appreciate your co-hosting this weekend and hope your having a great time. Thank you Anna! I would have one heck of a yard if I could grow everything that I wanted. I’d have a chicken coop too! The colors are gorgeous – a real feast for the eyes! Great shots, Julie! Thank you Ana! Are you a mango eater? I grew up eating mangoes Julie, and will have to say it is probably my most favorite fruit. Your fruit salad ticks all the boxes for me, love the crunch of the fennel, so catchy too with those gorgeous colors. Roll on summer, can’t wait for the supply of mangoes then. Thank you Loretta! I think mangos have to be at the top of my list too, and another would be the fresh summer strawberries. I am really getting spring fever but I’m really jumping the gun. We had snow this week and today is almost 50. Have a wonderful weekend! Such a gorgeous salad! Sounds like a wonderful combination of ingredients. It’s on my list! Thank you Sarah! I just love colorful food this time of year because it helps me pretend that spring is right around the order. LOL! Beautiful salad Julie. This would be perfect for Easter. Thank you Quinn! It just might make an appearance! Do you cook? I always get the task, but I don’t mind Easter because it always seems like a spring holiday. Thanks Nancy! I really appreciate your support! You’re such a great girl. What a gorgeous and elegant looking salad Julie! Love all the ingredients there! Thank you Sonal! The colors make me wish for summer.